During our society's 100th anniversary in 2014, a project was initiated, in conjunction with the Town of Richmond Hill, to erect a permanent structure in honour of the society's contributions to the Town. The selected structure, a large archway, was recently installed on the grounds of the Town's Public Library. 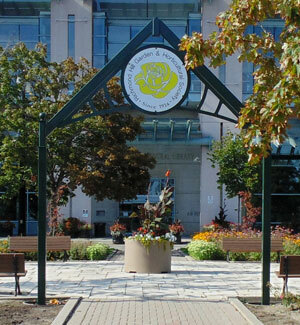 An official unveiling ceremony will take place on September 29th, shortly before the Richmond Hill Blooms Gala Celebration at the Performing Arts Centre.